Imagine you want to build a playhouse in your backyard. You get the idea that you can do this so you head down to Lowes, walk in the door and head over to the lumber aisle. I know this sounds silly, but this is almost exactly what most photographers I’ve talked to are doing with their Facebook ads. They decide to run an ad, then head into the ad manager without a plan. Find a pretty picture, pick some basic targeting (age, location and relationship status… maybe a few interests), and send people to the home page of their website. If you want to be successful with Facebook ads, you need a plan! Today, we’ll start with the foundation. When I talk about objectives in this post, I am referring to the actual campaign objectives available from Facebook. We’ll get to those in a few minutes. I like to break down objectives into quadrants. Each quadrant has a different metric for measuring success. Two are on Facebook and two are on your website. Keep in mind that you don’t have to start with the top left and progress in order. You can run ads in any quadrant at any time. The quadrants are like “super objectives.” They help you manage your expectations and measure the right metrics for your ad. Campaign objectives can also fit into multiple quadrants, depending on the intent and content. Don’t worry if this is a little confusing right now, just keep reading and it will all make sense by the end of the post! Some people will tell you that getting reach or likes is a waste of money. You’ll hear people say that boosting posts isn’t real advertising. There was a time when you could post something on Facebook as your business and it would reach thousands of people organically. It was so easy to get word of mouth referrals because you could easily stay at the top of people’s minds. We all know it isn’t quite that easy anymore. If you post the right content, you can still get decent organic reach on FB (don’t believe people who tell you otherwise). But even when the reach is somewhat disappointing, you can still reach thousands of people for a few dollars by boosting the post to the people who like your page and their friends. A FEW DOLLARS. Seriously, we need to stop complaining about this and start being thankful that we have such an amazing opportunity. I’ve known this to be true in my photography business. When I look busy (and people are seeing my posts regularly on FB), people believe I am in high demand. Being in demand makes people talk about you. People talking about you leads to people hiring you. However, you have to understand that the WHOLE point of this quadrant is awareness. Your only concern should be getting people to see your work. The problem is that they are expecting conversion results from an ad in the awareness quadrant. In this quadrant, you need to be willing to spend money to reach people. That is the only metric you should use to measure success with these ads. Don’t mishear me and think that I am saying that reach is the most important metric all the time. Reach is only one small piece of the puzzle. I don’t recommend spending very much money on this quadrant. For most photographers it is between $10-50/month. Ultimately we want to leverage success here (more reach, increased brand recognition, top of mind awareness) to increase success in the other quadrants. But for ads that fall into the top left, you should measure success by counting the number of eyeballs that see your work. Engagement is when people indicate that they enjoy your content. On Facebook that means that they click, like, react, comment, or share. And while we might wish that every person who sees our work would indicate that they enjoy it, that just isn’t how it works on social media. Just because someone doesn’t engage right now doesn’t mean that they don’t enjoy your content or that they won’t engage in the future. People who engage with your content are more likely to see your content organically in the future. They are also the people who are more likely to recommend you, and hire you. This quadrant often blends with reach and traffic. Sometimes just by getting more reach, you’ll automatically get more engagement. Sometimes by getting more engagement on Facebook you’ll automatically drive more traffic. However, I still find it useful to look at engagement as a separate quadrant. The real difference between the top left and top right is the metric you measure for success. Typically, you’ll always want to optimize your posts for engagement. But if you aren’t optimizing for engagement, you are still in the top left quadrant and shouldn’t be using engagement as a measure of success. For example, if you post a single photo without a caption and boost it, you should measure reach, not engagement. If you post a sneak peek and ask people to like their favorite photo, you should measure engagement. With experience, you’ll be able to skip the reach ads more often and start with engagement ads. This is where it really starts to get interesting. This quadrant focuses on sending traffic to your website. Your metric of success for ads in this quadrant are website visits. 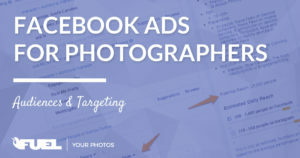 One of the most common frustrations I hear from photographers is that they are sending traffic to their website with Facebook ads, but nobody is contacting them. Without fail, those same people will tell me that they sent that traffic to the home page of their site without a clear call to action. Just like the top left quadrant, the real goal here is awareness. However, there are two reasons that website traffic is significantly better than Facebook post reach. People are taking action. They had to leave what they were doing (browsing Facebook) and go check out your website. These people are moving along the path of conversion by taking the next step. You can build a website custom audience with this traffic. We’ll get into this more next week, but basically you’ll be making an audience of people who have visited your website so you can show them specific ads in the future. I know it is tempting to want more from this audience, but when you run ads in this quadrant, you only need to track website visits as a measure of success. The ultimate goal of your marketing is to gain new customers. To do this, you’ll need to make an offer. When you make an offer, you measure your success by the number of people who complete the task that you ask them to take. Sometimes that may be submitting a contact form on your website, other times that might be downloading a free guide. When you run ads in this quadrant, you are asking people to do more than just visit your site. You are asking them to take action. Eventually, you want as many people as possible to land in this quadrant. However, you don’t want this to be their first exposure to your business. If the first time someone hears about your business is from an ad that makes an offer, they are very likely to tune you out. It would be like walking up to a stranger at the grocery store and asking them to marry you. Instead, the ads that fall into the offer quadrant should be reserved for your warmest audiences. They already know you, like you, trust you, and they’ve received value from you. When you make an offer, they naturally want to say yes! Now that we have defined the quadrants (our “super-objectives”), let’s take a look at the campaign objectives available for your ads. 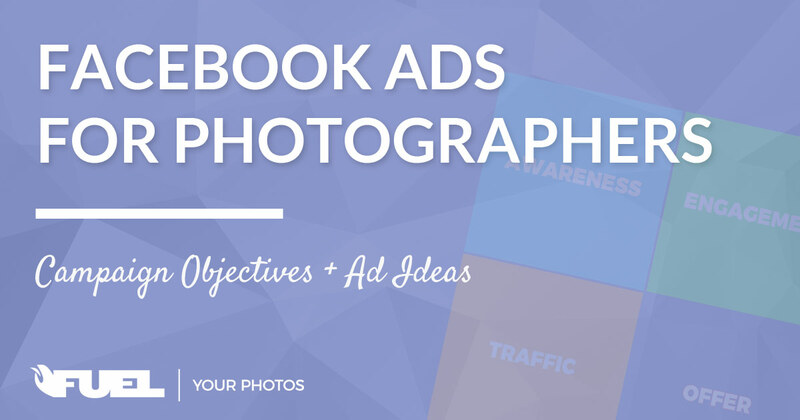 I’ll show you the objective types that I recommend for photographers, then I’ll give you some examples of campaigns using each type of objective. Most people are already familiar with this objective. You don’t even need to use the ad manager or Power Editor to run these ads. You can simply boost the post with a built in button on the post itself! Boosting a post creates what is called a “Page post engagement (PPE)” ad. If you use the boost button, you won’t have all of the same options available in the Power Editor, but you’ll still be able to choose your audience/targeting (including custom audiences). By running a PPE ad from the Power Editor, you’ll also be able to choose and customize placement options (like what image shows up on Instagram), change optimization and bidding, and even run multiple versions for split testing. You can also choose to run “dark posts” which are posts that don’t show up on your page organically. Boosting/PPE ads can actually be very powerful when used correctly and creatively. Boost your posts to stay in front of your audience. Remember, busy begets busy. Look busy by consistently showing up in the feed of people who like your page. Pick one post per week that you want more people to see and give it a boost for $5. Show off your expertise by posting a before and after edit of the same photo. Boost the post to raise awareness of your editing abilities. Upload multiple photos and ask people to comment on their favorite. Ask people whether they prefer a black and white or color edit. Offer a reward to the client in the photos if they receive a certain number of comments. For example, the clients get a free 8×10 photo with 50 comments. (I can’t personally find anything in the FB TOS that prohibits this, but use at your own discretion). Ask people to caption a photo or describe the photo in one word. Make it funny or inspiring for even more engagement! Ask people to tag someone who ______. For example, you might post a photo of siblings from a family session with an inspirational quote about siblings being best friends. Then ask people to tag their siblings if they are best friends. Post a blog post with a clear call to action and boost the post. PPE ads are optimized for engagement, not clicks, so make sure to test the effectiveness of boosting posts with links. This campaign objective is pretty straightforward! The ad type is technically called a Clicks to Website (CTW) ad. Remember how I mentioned above that PPE ads are optimized for engagement, not clicks? Well that is where CTW ads come in handy! They are optimized for clicks by default. That means that Facebook will help you get the most link clicks at the best price. This objective should be used almost exclusively in the bottom-left (traffic) quadrant. I like to use these ads when I want people to visit my website, but I don’t necessarily want them to take any other specific actions. It is a good way to get people familiar with your work and your website before asking them to take action. Sorta like a first date. Don’t go for the kiss here (unless things went really well and they initiate). Create a roundup or educational blog post that appeals to your target demographic. If you need a list of ideas, click here! Tell an inspiring story. Don’t just send people to look at yet another gallery of images. Show them that your work is deeper than surface level and that you care about your clients. Video is exploding in 2016. If you aren’t using videos you are missing a huge marketing opportunity! I’ve talked before about using YouTube videos for SEO, and now I’m telling you that you should be using Facebook videos for ads! Facebook execs have said on multiple occasions that they believe the platform will be MOSTLY video by 2020. An awesome new feature for advertisers is the ability to create custom audiences from video view engagement on Facebook! We’ll talk more about this next week, but essentially you can create an audience based on people who have viewed a specific portion of your video, then run ads to that audience! This is super exciting because you don’t need to send people to your website to get them into a custom audience, and video views are currently very cost effective compared to other ad types. Share a sneak peek from a session as a video slideshow. Use Animoto to make these videos quickly, and to access an excellent library of licensed music! Hire a videographer to create a promo video for your business! If you are comfortable on camera, make a series of videos where you give tips that would help your target demographic. You could also tell stories about what photos mean to you, or talk about why you loved working with certain clients. Make videos featuring local venues, parks, things to do, vendors, or anything else that might interest your target audience. This ad type (aka Website Conversions or WC) is ever so slightly different than the CTW ads. The main difference is the delivery optimization, where Facebook will show your ad to people who are most likely to complete an action on your website. This is one of those things where you just have to trust Facebook (but also verify results by testing). If you are asking people to take action on your site (like fill out a form, or download a guide), this is the ad type for you! This one will require a little bit of extra technical expertise (you’ll need to tell Facebook how to track the conversion using your FB pixel), but the process is fairly straightforward and well documented. If you are asking people to take action on your site (like fill out a form, or download a guide), this is the ad type for you! This one will require a little bit of extra technical expertise (you’ll need to tell Facebook how to track the conversion using your FB pixel), but the process is fairly straightforward and well documented. These ads are best for a warm audience. You’ve already been dating for a while and now you are ready to pop the question. Use audiences created from previous ad types as your target for WC ads. Send people to a page on your website that outlines the details of a special offer. Maybe you have mini sessions coming up, or you are offering 10% off of winter weddings. Send them to a page that gives all the details and ask them to inquire to reserve a spot or get more details. Set up a pricing/welcome packet that can be downloaded from your site. Ask for an email address so you can follow up, then send them to a page to download the guide. Put together a useful packet with discounts or bonuses from other vendors. Ask for an email address or physical address so you can send the coupons. Offer a limited quantity of a free item (like a picture frame or t-shirt). Get a mailing address so you can send their gift. You may want to run this one “dark” or target people who are not connected to your page. Offer a special session date or event to loyal blog visitors. Use a website custom audience to target people who have viewed multiple blog posts. This ad type lets you collect leads right on Facebook! Basically, take any of the ideas from the Website Conversion ads and let people register on Facebook with a lead form instead of visiting your website! It is a little more difficult to set up automation, and you won’t be able to redirect them to a thank you page (although you can ask them to visit your site). You also won’t have complete control over the experience. For example, when you send someone to your website you might choose to show them a few photos or even a video before asking them to fill out a form. That being said, there is also a huge benefit to keeping people on Facebook, and offering a simple way to complete an action (even on mobile). You can also set up a custom audience of people who opened or filled out your lead forms. So even if they don’t complete the form, you can retarget them with an ad to see if they are still interested. Pretty cool stuff. You’ll need to test this ad type against Website Conversions to see which one generates more (and higher quality) leads for your business. Use the “Get Quote” button so that people can give you their contact information and get a quote for your services. Use the “Learn More” or “Download” button to send people a pricing guide or welcome kit. Use the “Apply Now” button to have highschool seniors apply to be senior reps, or to offer exclusive sessions that require application. This is a really cool ad type that works well if you want to host a live event. You’ll create an event on your page, then use this ad type to get more event responses. So many people ignore events, and this ad will help you get the event information into their newsfeed. Host an event for prospective brides where you invite other wedding vendors to come and show off their services. Take turns doing brief presentations or introductions or just set up information on tables around the room. Think of it as your own personal bridal show. Host an event for expecting mothers and invite a prenatal masseuse who will give free massages. Or partner with a local birth center that already offers classes and “sponsor” the event by offering free breastfeeding mini sessions. Host an event with a local chamber of commerce, incubator, or other business group where you offer discounted headshot mini sessions. Have someone speak about the importance of using professional photos online. This is an ad type that works in conjunction with page offers. You’ll need to set the offer up on your page before you can run this ad type. You can come up with any kind of offer that uses a percent off, amount off, BOGO, or free stuff. The possibilities are endless. Use these types of offers sparingly, but have a set time once or twice a year where you make a generous offer. Day after Thanksgiving sale: 25% off gift cards of $100 or more. Engagement season discount: in January only, get a free guest book from your engagement session with the purchase of any wedding or engagement package. I love this. I’d really like to pin it to save for later. You may want to put the little pinterest widget on it- free advertising. Great suggestion! 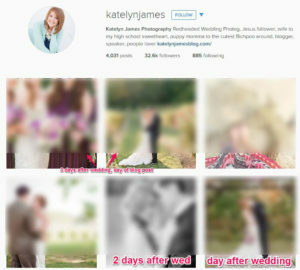 Still working on getting the right social sharing options set up for the blog!